Whose Hair Will You Wear? It is time for our Second Hair Fair 2011 Photo Contest. When this years build was created, it was always the intention of the committee to make it as photogenic as possible. We invited aDORKable Poses to join us once again in this endeavour. This year they have exceeded our expectations, and the sims are really fun to be at. Many have already taken such incredible pictures of the builds, we want to step that up into a mix of Hair Fairs latest releases, you and the pose oppurtunities available. 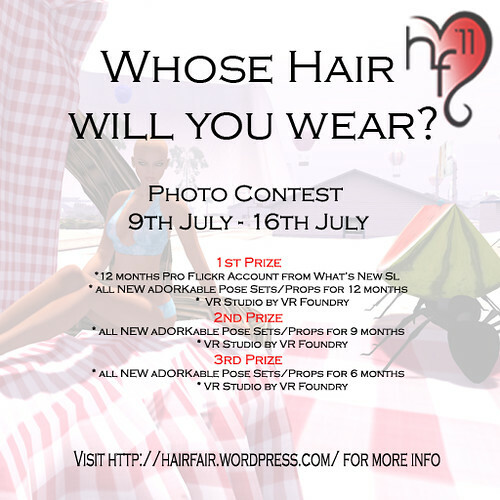 This contest starts NOW and will end on the day after Hair Fair officially closes – which is the 16th of July at midnight. The photo you enter must have you – or someone granting you permission to take their pic – in the photo with NEW Hair Fair 2011 hair on. Posed on one of the aDORKable poseballs set up at the fair, with the prop and/or fairground in the background. The hair must be recognisable as Hair Fair 2011 hair, and the pose must also be recognisable as one at the event. So be careful when cropping your pictures. You will find all the rules on the flickr group page, but please please make sure you tag the photos and put the description in as asked. Failure to do so will void your entry, and that makes us cry. Prizes have been donated by What’s New SL, aDORKable Poses and VR Studio.